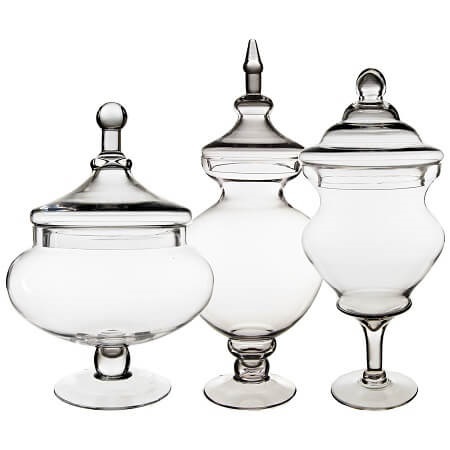 This set of three Glass Apothecary Buffet Candy Jars provides a beautiful backdrop for your store. Line shelves, arrange tables and set up the glass jars for a fun display of your colorful candies. 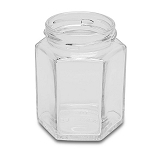 Bulk gummies, wrapped hard candies, shaped and brightly colored sugar treats are all going to shine in these glass jars. Candy buffets are a highly popular item to include in celebratory events. These glass candy buffet jars are a perfect way to let guests see all the candy held inside while making a stylish display with the variations in the shapes and sizes of the jars. Tie off a colorful ribbon at the top for a decorative touch or to hang small signs off of announcing what is inside each container. 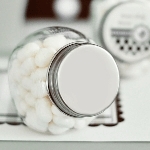 The wide opening on the glass candy jar is perfect for scoops so guests can help themselves with no issues. Use the glass containers around your home to showcase decorative items such as potpourri, limes and lemons, ornaments, and sand with a candle nestled in it. If you have a creative idea, you can use these jars to achieve it. You can also organize your kitchen or bathrooms so that you can easily see and reach items and have them be arranged in an attractive way. Order your glass container set today! Height: 21.5" Opening: 5.75" Body Width: 7.5" Base: 5.5" Thickness: 1/8"
Height: 15" Opening: 7.75" Body Width: 9" Base: 5.5" Thickness: 1/8"
Height: 16.25" Opening: 6.75" Base: 4.5" Thickness: 1/8"